Musicworks collects information from individuals and educational institutions, including the individual's and/or institution's name, mailing address, phone number, fax number, and e-mail address. This information is collected for the following reasons. To mail the magazine to an individual or an institution. To arrange renewals of subscriptions. To help direct editorial content to satisfy the readers' needs. To ensure that advertisers are reaching their targeted audience. To provide information to reputable third-party organizations whose products or services may be relevant to Musicworks readers. To fulfill circulation audit requirements. 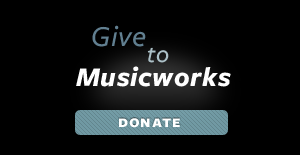 Upon requesting a subscription to Musicworks, an individual consents to having information used for mailing the magazine and any communications pertaining to their subscription. You will also receive our monthly e-newsletter. You can unsubscribe from e-mail communications at any time (simply reply to an e-mail from Musicworks with "Unsubscribe" in the subject line). We make every reasonable effort to protect against the loss, misuse, and alteration of personal information under our control. Our security policies are periodically reviewed and enhanced as necessary. Only authorized individuals have access to customer information. We keep your information for the time we are providing you with a product or service, and for a reasonable time thereafter in the event that you wish to resume service.